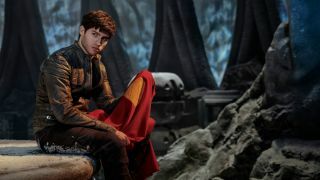 "Every choice that Seg makes will affect the legacy of Superman here in the present day"
Syfy's new series Krypton will air on March 21, telling the story of Superman's home planet before the Man of Steel was even a twinkle in anyone's eye. Cameron Cuffe plays the young Seg-El, Superman's grandfather, and spoke to SFX about how his character differs from the superhero we all know. "The great thing about him is that while there are similarities - there is this hatred of injustice - he didn’t have the beneﬁt of growing up with Ma and Pa Kent in a loving, nurturing environment," explains Cuffe. "[Seg-El] grows up in a society that’s seemingly utopian, but is edging towards authoritarianism. So it makes him a bit harsher. A bit rough around the edges. These lofty things like truth and justice seem very, very far away. The story is about how he grows into that role, and how that symbol comes to mean what it means now." Cuffe has previously appeared in the movie Florence Foster Jenkins, TV show The Halcyon, and lent his voice to a couple of video games, but this is the first major role for the young Londoner. "This is an immensely ambitious show, and the sets are incredible. It’s a big job. But the thing is, it’s all real," he says. "All the interiors and all the costumes and every single prop has a purpose. This society is so well ﬂeshed-out. Because it has to be. There has to be political drama, there has to be personal drama. So it has to look and feel real to an audience." The series will follow Seg-El and his family 200 years before the events of the movie Man of Steel. In this pre-Superman era, the House of El has been stripped of its upper-class trappings and so has fallen to the lowly station of "rankless." From this position, at the very bottom of Krypton's society, Seg must fight to restore his family's name. "While there is the political intrigue and drama of Krypton 200 years ago, the ramiﬁcations of every choice that Seg makes will affect the legacy of Superman here in the present day," says Cuffe. "So there’s a lot going on in the show. It’s an epic, high-concept science ﬁction story that [transcends] time and outer space." For more on Krypton, Ready Player One, Jessica Jones and more, grab issue 298 of SFX. It's on sale now, and you can check out a preview here. We're also available on Google Play and Zinio, and most digital formats give you a 30-day free trial, so you can try before you buy! For Apple users: click the link and you’ll be directed to SFX's page in the App Store - once there, install the SFX app, or - if you’ve done that already - hit Open to be taken to the SFX storefront.